You are here: Home / Blog / General / How to clean enamel bath? One of the most common questions I get asked by my customers is what to use to clean enamel bath? I’ll answer this question later but first, let’s focus on the reason why your bath is getting hard to clean and what you can do to avoid problems? Why your bath is hard to clean and the type of bathtubs? 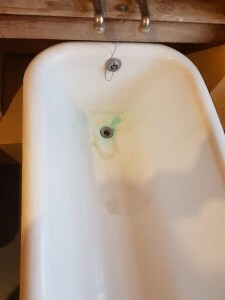 In general, there are two types of bathtubs – enamel coated (cast iron and pressed steel) and acrylic made (fibre glass, stone resin bath included). It is important to point out the difference, so you will know how to treat it and what is safe to use for each type. The first group of a topcoat (for iron and steel) is a glass-like material (vitreous enamel), second is a plastic (acrylic). Each has a different chemical resistance, and both finishes can be more or less delicate and immune to abrasion. What is the recommended product to use? bath resurfacing in progress – deep cleaning and deglossing the enamel surface. Some heavy domestic cleaners can etch your bath or porcelain sink – the last thing you wish for. As a rule of thumb, I don’t recommend any powder or cream cleaners, for a reason as above – it can scratch your bath finish. May not happen after a single time, but I’ve seen baths became dull after constant use of Jif or Vim. It’s not good for any type of a finish to use non liquid products, including renewed bath. Another reason to not use cream cleaners is that it may build up as a residue. Restored bath is most likely the easiest to clean – if done properly the finish is extremely smooth and so will least likely to catch the dirt and build up a scale. The cream cleaners will not only make the surface dull (abraded) but also can be a reason for surface discolouration. Baths get stained either with using aggressive chemicals, cream cleaners as mentioned above, but also it can be a water mark or serious water caused damage. 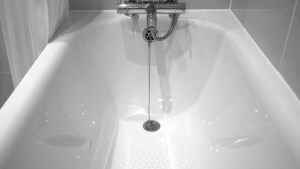 If your bath is not levelled properly or you have a leaking tap it most likely leads to an expensive repair to enamel and resurfaced tub. Standing water can destroy the bottom of your restored and original vitreous-enamel one. 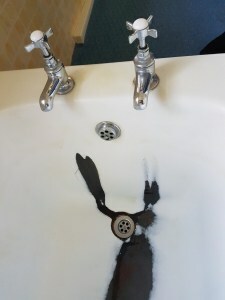 Make sure that your bath is levelled and you don’t have a leaking tap (standing water as a result of a leak, can also cause a rust around the waste area!). extreme example of water leaking damage to enamel. anti slip mat – take it out! If you use an antislip rug or mat, take it out after use (especially for re-enamelled one) and wash it from time to time. 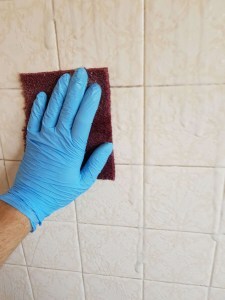 It is easy to trap the water under shower mat and if left for long enough, it is a perfect place for bacteria and mould. The non-slip rug can shorten the life of enamel and it’s a no-no for restored surfaces (avoid those with a suction cups). I offer an anti-slip application that is permanent part of a surface. It can be added anytime and also to not yet resurfaced bathtubs and shower trays. The hardest to keep in a good appearance are the ones with worn enamel. Why is the gloss finish getting porous and hard to clean? If it’s not by dirt, scale or abrasion, there’s a chance to etch the surface with some of the aggressive chemicals. If that happens, there’s no way to rescue a bath in another way than resurfacing. Vitreous-enamel is a very very hard material to polish. Even if you have a chance to clean the etched tub, it will catch the dirt again after a while, so a complete waste of time. Acrylic bath if treated with improper cleaner can even lead to cracks in a topcoat or cause the surface to melt or soften it. To compare the three – re-enamelled baths are the most chemical resistant. worn enamel is a nightmare to clean. If you have such a problem – don’t waste your time cleaning it, contact me to restore it. 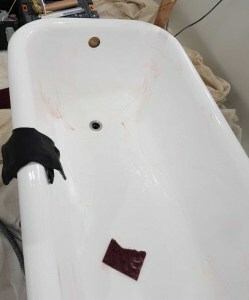 Finally, what are the recommended cleaners and methods to clean enamel bath? I’ll keep saying same over again – don’t scrub it. No matter what it is made of, use a mild domestic cleaner or a bathroom cleaner that is a proper liquid one. My personal choice is an Ecover bathroom cleaner, it’s effective, natural and has good reviews. Remember that if the standard cleaners fail, you can always drop me a line and I’ll give you a personal answer or recommend a service to fix your bath problem. Thank you for reading.